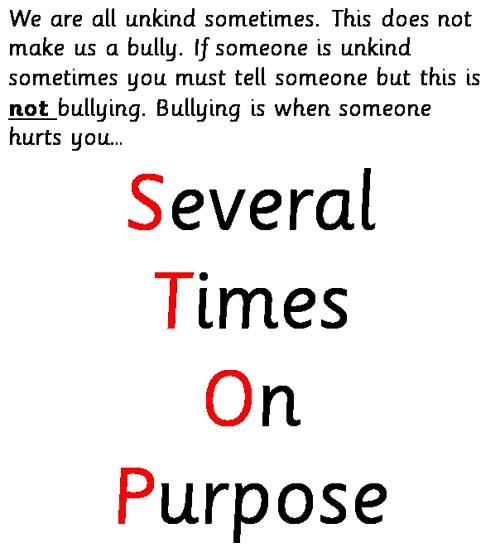 Bullying – what it means! Next week is Anti-Bullying week. Today we learnt more about the word bullying and what it means. We shared thoughts, ideas and new facts about bullying. We thought about what it means to be a bully. We also learnt that watching someone be bullied is almost as bad as being a bully. If you see it – speak up! We learnt how to say ‘Stop – I don’t like that’ and speak up for ourselves. We also focused on ‘trusted adults’ and who they are in school and outside school. We are now fully informed and ready for anti-bullying week next week!